DAVAO CITY – Will lightning strike twice inside the USEP Gym? an unlikely split decision victory. The loss sent Bautista into a brief retirement while Ramirez would lose to Vasyl Lomachenko six months later. Three Mexican fighters are keen on doing an encore this Saturday. Jason “El Niño” Pagara (34W-2L,21KO's) (above photo) of the ALA Gym will stake his lofty world ranking and WBO International junior welterweight title in the twelve round main event against Mexico’s Cesar “El Dolar” Chavez (23W-7L,11KO's). 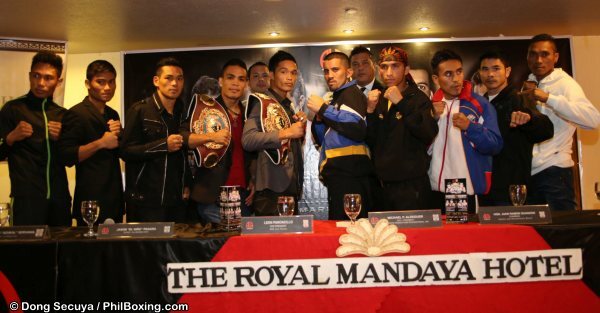 The protagonists came face to face Thursday during the final press conference held at the Royal Mandaya Hotel. ‘I am 100 percent ready,’ Pagara countered, “I have prepared well and ready to show the fans what I can do.’ Pagara also said that he will also go for a KO. Chavez got the moniker “El Dolar” from his trainer because just like the dollar, he goes up and down. He said that he has one shorter leg which makes him do that. This is similar to a Filipino former two division world champ Dodie Boy Peñalosa. ALA Promotions CEO and Pres Michael Aldeguer stated that they are looking at Pagara’s progress as a fighter, whether he is ready for the big names in his division. They plan to bring him to the U.S. for further training and exposure is he comes up with an impressive win. 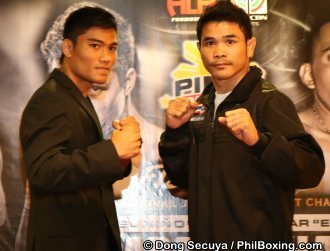 Pagara has Danny Garcia on his wish list of future opponents. Main headliner Jason 'El Nino' Pagara and his Mexican opponent Cesar 'El Dolar' Chavez (C) pose with ALA President Michael Aldeguer and WBO Vice-President Leon Panocillo (standing, back) and the undercard fighters during the final press conference of Pinoy Pride 29 held at the Royal Mandaya Hotel in Davao City Thursday afternoon. Genesis “Azukal” Servania of the ALA gym, who is the number one ranked 122 lb contender in the WBO, will be risking his WBO Intercontinental belt and top position against Juan Luis “Perla Negra” Hernandez of Mexico. Hernandez (17-3-1,9KO's) said that he got his moniker from famous promoter because just like a pearl, he is rare. 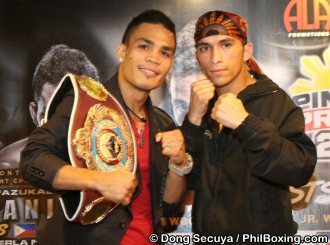 Servania (25-0,11KO's) is aware of the stakes considering that he is nearing a showdown against Guillermo Rigondeaux. Servania said that he has prepared well and will give the fans a good show. Another world ranked ALA gym boxer, “King” Arthur Villanueva (26W-0L,14KO’s) is in for a tough test against another Mexican boxer and former WBO world flyweight champion Julio Cesar “Pingo” Miranda (38-11-2,29KO’s). 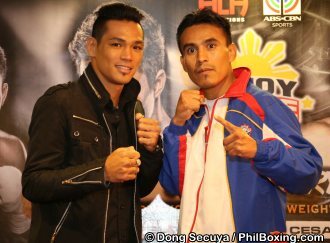 Miranda is familiar to Filipino fans with his 2W-2L record against Pinoy boxers, having beaten Richie Mepranum and Ardin Diale and losing to Brian Viloria and Rodel Mayol. Miranda spoke about his first visit to the Philippines when he lost to Mayol. “I was not well prepared for that fight. But like a true Mexican warrior, I fought till the end.” He also said that he got his moniker from his family. Prospect to watch Mark “Magnifico” Magsayo (9-0,7KO’s) will face a Thailander, Sukkasem Kietyongyuth (13-3,8KO’s) while Arjan “Spartan” Canillas (9W-0L-2D,7KO’s) will be pitted against his first foreign foe, Indonesian Stevi Ongen Ferdinandus (15-7-1,8KO’s). Magsayo (L) and Sukkasem Kietyongyuth. Sukkasem was knocked out by Ik Yang of China in a WBO Asia Pacific title bout last August but his corner Mr.Win Ngaotawan said that he was too small fighting at 135 and Sukkasem is more used to 122. Three all-Pinoy match-ups round up the undercards – Vic Saludar vs Lester John Prongco (8rounds), Rafael Sueno vs Arnold Garde (6 rounds) and Brian “Buhawi” Lobitania vs Armando Yee (6 rounds). PINOY PRIDE 29: FISTS OF FURY will be at the USEP Gym February 7. Preliminary bouts start at 6pm.